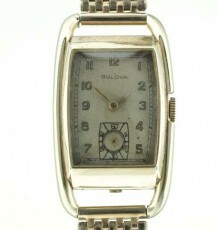 Unworn vintage Bulova solid gold watch. Presentation engraving dates it to 1942. A long curved Bulova with a solid gold case. 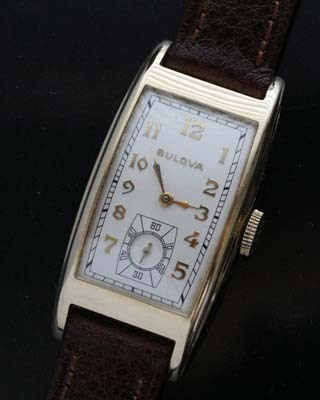 This elegant Bulova watch, dates to 1942 based on the detailed inscription on the back. 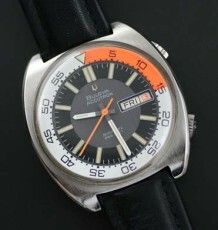 Also engraved or stamped on the back is the 14 karat gold rating for the case as well as the serial number of the watch. Please note the stepped sides of the nicely curved case. Similar to the Gruen Curvex of the day only without the curved Gruen movement. 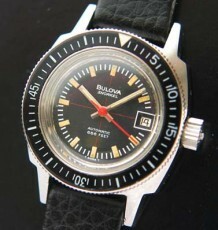 The watch is fitted with a 17 jewel barrel shaped Bulova Calibre 7AP movement which is pristine. 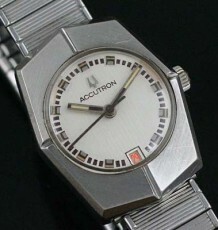 This watch does not appear to have been worn by the previous owner as were many watches given as presentation pieces. The all original white dial is in excellent condition and features raised gold Arabic numerals with an elongated sub-seconds chapter in the lower half of the dial. The watch case measures 42 mm long by 21 mm wide and can be supplied on a black or brown leather strap.